The world has suffered an alarming increase in terrorism events over the past five years. Equally dramatic is the spike in terrorism-related fatalities. While the vast majority of terrorist-related killings are concentrated in the Middle East, North Africa and Central and South Asia, European Union (EU) member states are not immune. A string of high-profile and exceedingly violent attacks over the past few years have set Europeans on edge. While these attacks are devastating, EU countries experience an extremely small proportion of the world's terrorist events. Notwithstanding the appalling attacks in London and Manchester, just 39 Europeans have died in 11 terrorist events thus far in 2017. This means that EU residents accounted for 2% of all attacks and 1% of all killings around the world in the first five months of this year. This is not so say that the EU isn't facing a genuine threat of terrorism. As residents of Athens, Brussels, Copenhagen, Hamburg, London, Manchester, Nice, Paris, Prague and Stockholm can attest, the past three years were exceedingly bloody. While the terrorism data is patchy and error-prone, the best estimates are that 142 EU citizens were killed in 2016, with most of the victims from France (92), Belgium (32), and Germany (26). The toll was even higher in 2015 when some 176 people were killed in terrorist attacks, most of them from France (161) and others from Denmark (2), Germany (5), Greece (1), Sweden (4) and the UK (1). The recent spike in terrorist-related fatalities in the EU is striking in comparison to absolute numbers of violent deaths in previous years. Between 2010 and 2014 there was a total of 37 reported terrorist killings in all EU countries combined, divided between France (10), Bulgaria (8), the UK (6), Greece (5), Germany (2), Czech Republic (2), Belgium (1), Estonia (1), Ireland (1) and Sweden (1). Assuming steady EU population growth between 2010-2014, it is possible to determine an average annual death rate from terrorism. Modern terrorist attacks are designed to lay siege to entire cities. Predictably, billions of dollars are being spent to harden targets across the EU – from establishing no-go areas in cities to investing in blast-proof buildings. But what is the real likelihood of a European being killed in a terrorist event? The question is surprisingly tricky to answer, and depends largely on where he or she lives. Even when adjusted for population sizes, the risks are clearly higher in Belgium, France, Germany and the UK, since this is where most events have occurred. 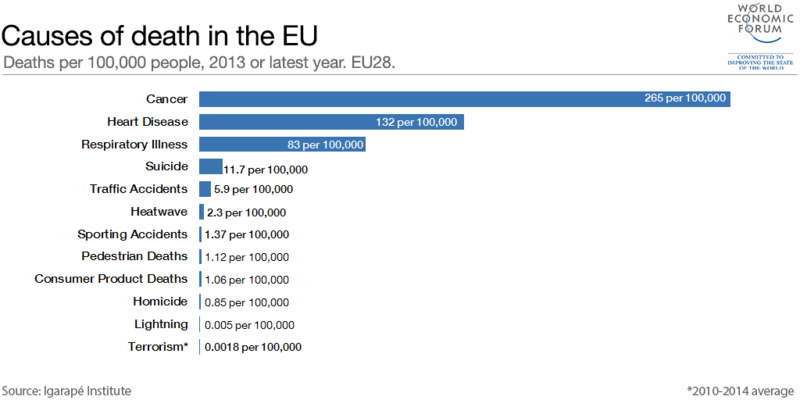 Not surprisingly, the overall prevalence rate of terrorism deaths in the EU varies from year to year. In 2016, the terrorism death rate was 0.027 per 100,000 European residents, assuming a population of 510 million people. In 2015, the rate was closer to 0.034 per 100,000 with a total population closer to 508 million. Meanwhile, because the total number of people dying from terrorism was considerably lower, the average terrorism death rate between 2010-2014 was closer to 0.0018 per 100,000. How do these prevalence rates stack up against other major causes of death in the EU? It turns out that heart disease, respiratory illness and cancer are several orders of magnitude more dangerous as threats to the health and welfare of Europeans than terrorism. The region's average mortality rate from heart disease was approximately 132 per 100,000. By a rough estimate, in 2016, Europeans were 4,888 times more likely to die from heart disease than a terrorist attack. Between 2010-2014, they were 73,333 times more likely to be felled by a diseased heart. So how do less frequent causes of mortality such as homicide, suicide and traffic accidents compare? Again, using data from 2016, Europeans were 433 times more likely die of suicide, 218 times more likely to be killed in a car accident, and 32 times more likely to die of homicide than a terrorist incident. And in 2010-2014, the odds were significantly skewed: EU residents were 6,500 times more likely to die of suicide, 4,377 times in the case of car accidents, and 472 times in the case of homicide. Even with the heightened risk of terrorism, Europeans are much more at risk of dying of consumer products, in sporting accidents and even heat-waves than terrorism. Using data released in 2016, the risk of dying from machine accidents, consuming toxic products and hot-water accidents is 39 times higher than from terrorism. Dying in a bicycle, skiing or water-sports accident is 50 times more likely than being killed by a terrorist event. And Europeans were 85 times more at risk of dying from a heat wave (during the hottest year). In 2010-2014 the odds were closer to 588, 761, and 1,272 to one respectively. The odds start changing when it comes to extremely rare events. Take the case of lightning strikes. There were reportedly 26 European fatalities due to lightning strikes in 2016, though again, the data is extremely hard to verify. Assuming this statistic is even close to being true, Europeans were 5.4 times more likely to be killed by terrorism than lightning in 2016. Intriguingly, the odds were dramatically reversed between 2010-2014: Europeans were almost three times as likely to be killed by lightning then by terrorism. Terrorism is designed to spread fear and grind urban life to a halt. The threat is real, but the response must be proportionate. While there is an exceedingly low-probability of dying from terrorism in the EU, there is a 100% likelihood of more terrorist events. Yet the risk in Europe is dramatically lower than just about anywhere else on the planet. EU residents need to focus not just on mitigating terrorism through better intelligence, policing and community outreach, but on developing the tools to adapt, cope and bounce back when attacks periodically occur.